Comic, tenor, clarinet talent, and voice of Disney's "Dopey"
>> Hear Rheiny sing the lead in a favorite of his family, the traditional Swiss song, "I am a Glarner Boy." This stationary has the letterhead of the Alpine Record Company in Portland, Ore. This is the record company that produced Swiss Family Fraunfelder recordings in Portland, Ore. and San Mateo, Calif. The company actually may have been owned and operated by the Swiss Family Fraunfelder. 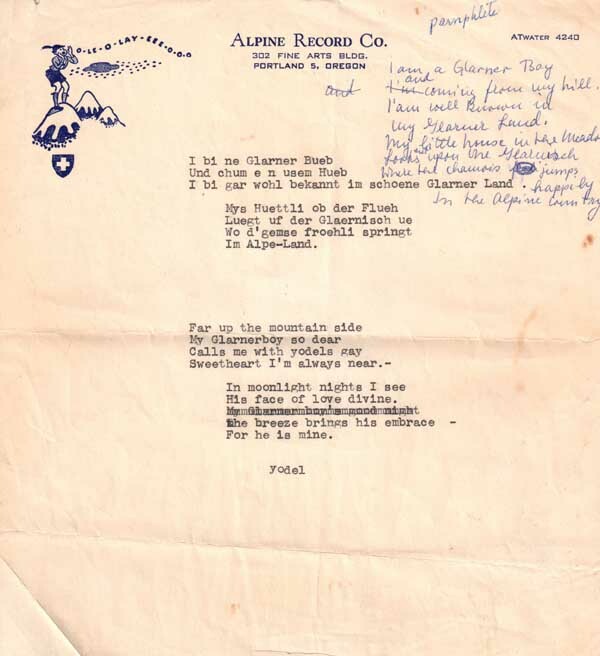 This stationary bears the lyrics for "Glarner Bueb," a traditional song about a Swiss boy. Rheiny Fraunfelder was the lead singer for this Fraunfelder tune, which is available on the music download page. The notes appear to be part of an effort to translate the song from Swiss-German to English.